All Items in this column are in stock or available from a local source. Payments are made through Paypal. Lawn Signs: Show your UNITED SUPPORT! All uniforms can be purchased by clicking the site below. 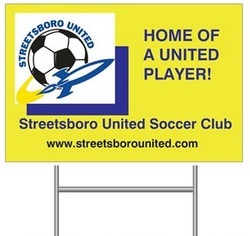 For all NEW Streetsboro United players, the uniform consists of a Streetsboro United Tabela 18 yellow jersey, Streetsboro United Tastigo 19 white soccer shorts, and Streetsboro United Copa IV yellow soccer socks. For all NEW United Junior players, the uniform consists of the White Under Armour United Juniors jersey. All of the gear is optional. Replacement jerseys, shorts, or socks can be purchased through the site below as well. Don't forget to get all geared up for the game and show support for your United player(s) and teams. Check out all the new gear loaded on the link below!!! Please feel free to message the club if you have any questions or concerns!! !